At a Glance: The CBD of Sydney is sparkling at the moment with gorgeous trees, twinkling lights and fabulous decorations! Why not have some fun as a family and go on a Christmas Tree Hunt around the city and count how many of the beautiful specimens you can find. There is so much to see and do in the CBD of Sydney this festive season. Whether you visit during the day or night your children will be in awe of the fabulous range of Christmas decorations and trees. Of course at night time everything is just that little bit more magical as the lights start to twinkle and turn the CBD into a Christmas wonderland. We started our Christmas Tree Hunt at the iconic St Mary's Cathedral. 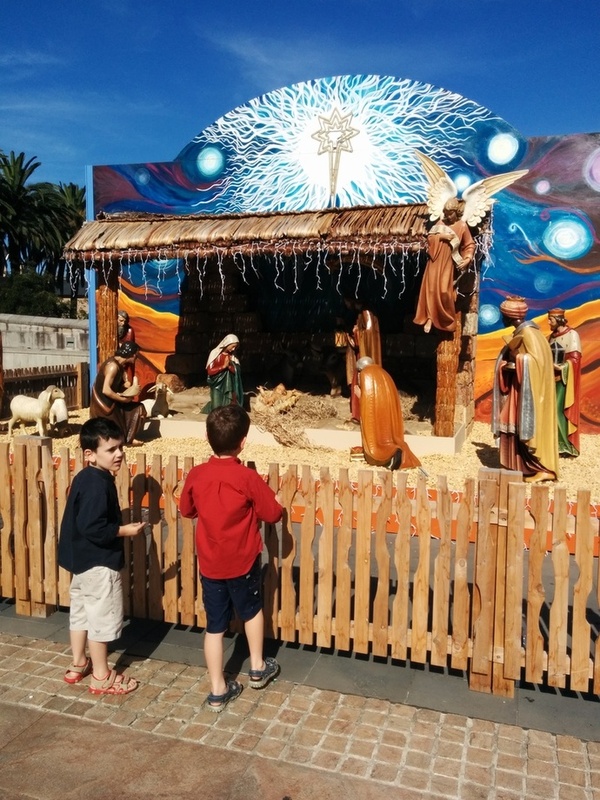 The reason for the festive season - the birth of Christ - is shown in a beautiful nativity scene which has been set up at the bottom of the Cathedral's steps. And right next to it is a Christmas Tree! Next walk across the road into Hyde Park, you will find at last one tree twinkling away in here. 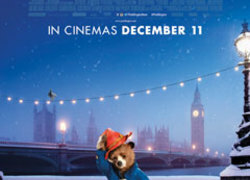 From Hyde Park cross Elizabeth Street and check out the spectacle of the David Jones windows. 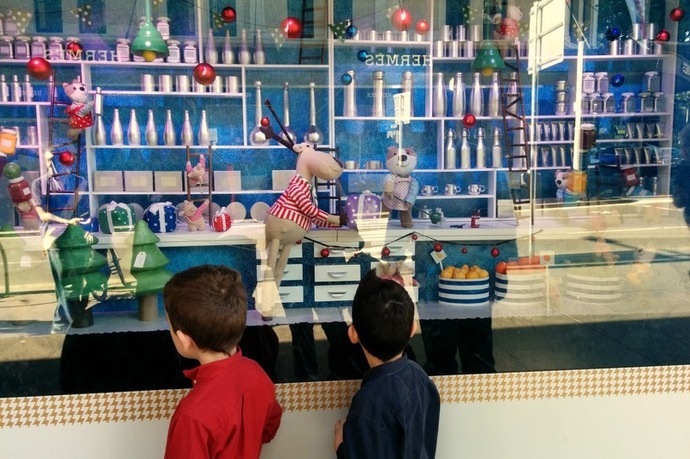 Kids will love watching the reindeer decorations coming to life and I think there are even a few trees in the windows that you can add to the tally. Once you've dragged the kids away from the windows cross the street and walk through the Westfield Shopping Centre and count up how many trees you can see in the beautiful high end shops! 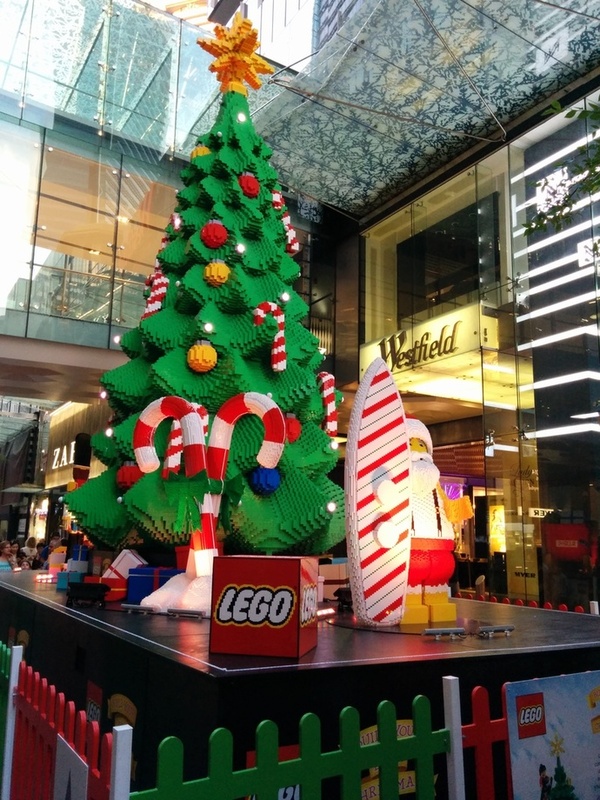 Exit Westfield into Pitt St Mall and you will find the famous Lego Christmas Tree. This tree is almost 10m tall and about half a million Lego bricks have been used to construct it! The Aussie Santa has both a surfboard and a sleigh. 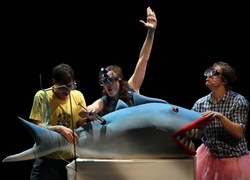 If you time it right, from 8pm in the evening there is a light and music show to add to the magic of the experience. From here wander down Pitt St Mall under the forest of Christmas Trees lights suspended from the sky. There are 25 trees and you can download an app to your smart phone that allows you to change the colours of the trees! 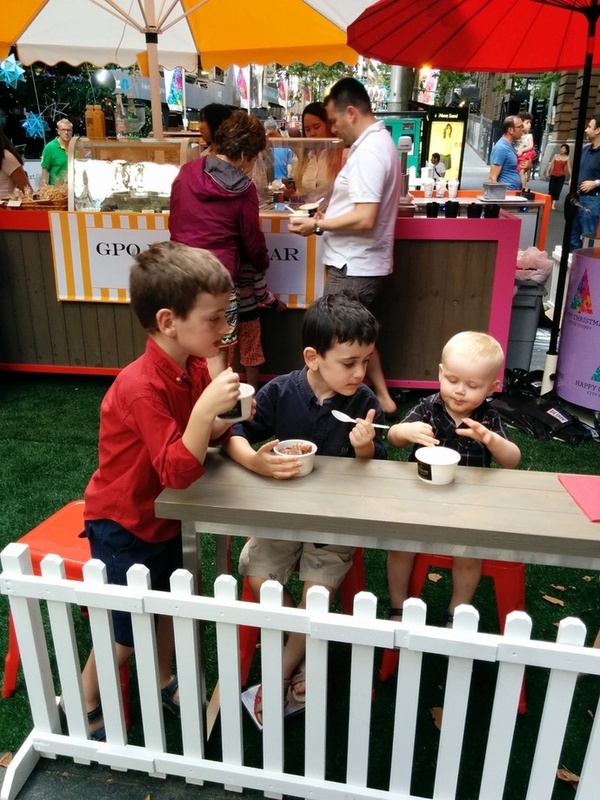 After you have had your fun in the forest, make your way to Martin Place. Along the way there will be numerous trees in foyers of buildings, shops and cafes. 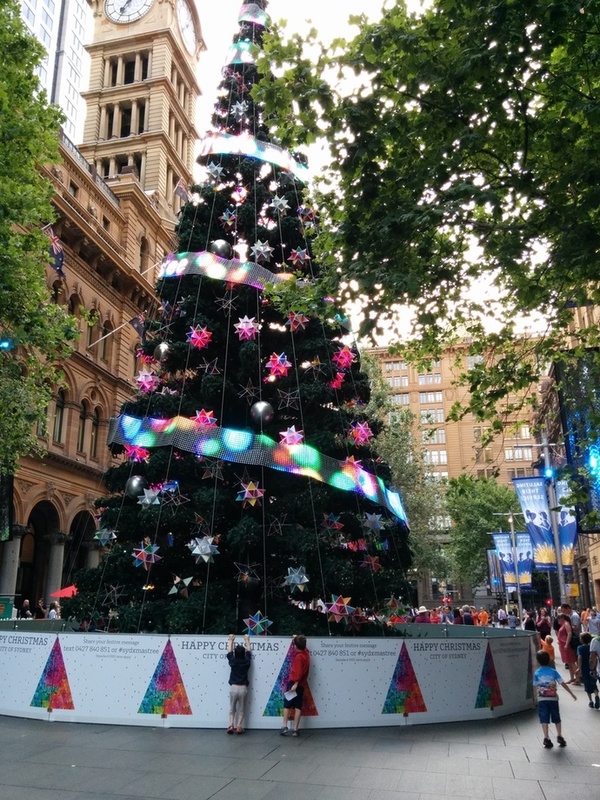 Once you have reached Martin Place stand in awe of the 20m high Christmas Tree that is topped with a 1.5m high star! There are 60 000 lights, plus loads of baubles and rubiks cube inspired stars all over the tree. But the coolest thing of all is the message ribbon wrapped around the tree. 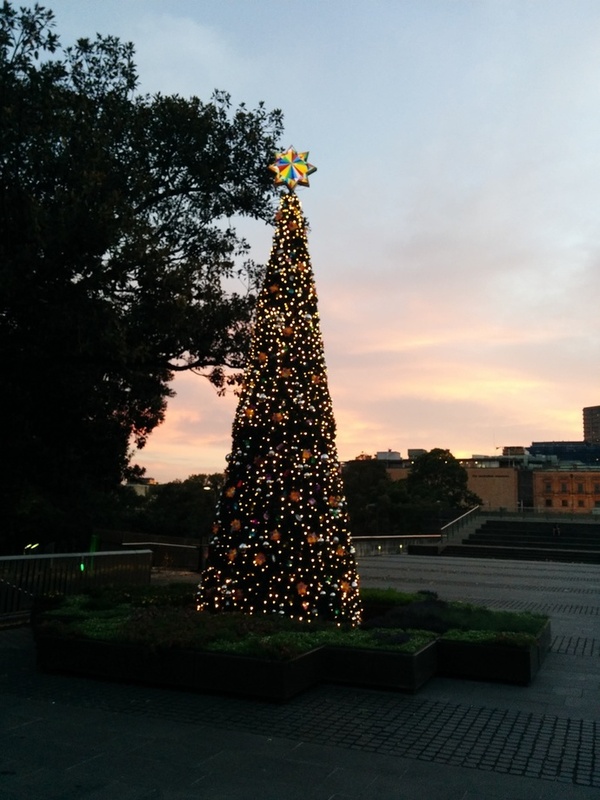 You can send your own message via text (0427840851) or #sydxmastree to see your very own message up in lights. There is also a touch pad kiosk where you can change the colour of the LED decorations on the tree. Once you see your message up in lights it's time to take a selfie on the dance floor! This is right next to the tree. When you stomp on the floor the lights underneath change colour. 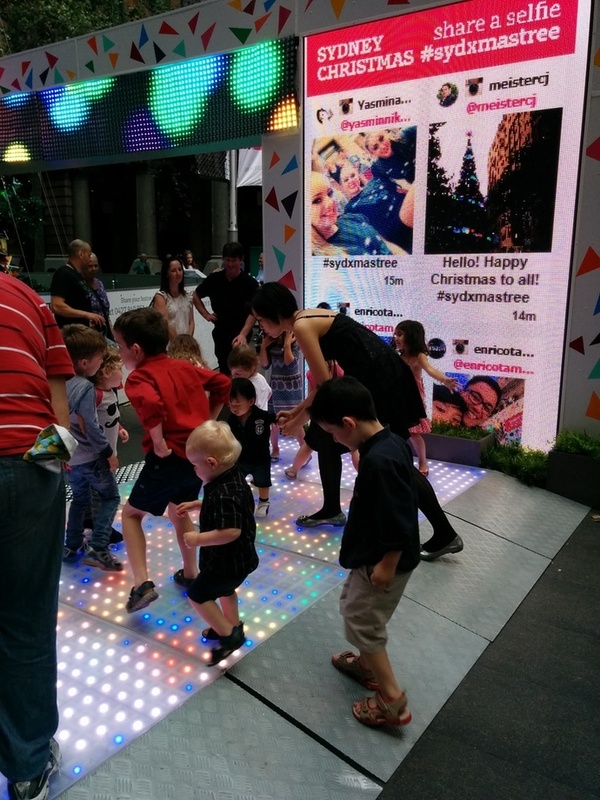 Take a photo of yourself dancing, instagram it and tag #sydxmastree, wait a couple of minutes and you will see yourself up on the large screen at the front of the dance floor! It's probably time now for some refuelling and the GPO Dessert Bar is the place to do it. There's ice cream, cannoli, reindeer cake pops, mini tarts, caramel popcorn, marshmallows plus loads of other treats and of course coffee. So have a sugar fix from before you continue your hunt. Now go for a wander along George Street in the direction of the QVB. You will find loads of trees to add to your list and probably the best tree has been saved to last. The QVB is renowned for their stunning Christmas Tree every year and this year doesn't disappoint. The towering Swarovski Christmas Tree rises up above three floors of this beautiful building.Your tally should be pretty big by now. You can of course keep hunting, there are so many more Christmas Trees around the city and also Darling Harbour to be found. However we called it quits after about the 100th tree as the little legs of our kidlets had run out of Christmas cheer.